New Theatrical Releases for period ending May 25, 2018. The following theatrical releases were added to the DVD & Blu-ray Release Report’s databases during the past week. ARR - Asset Rollover Rate (number of days between a film's theatrical debut and its subsequent availability as DVD and/or Blu-ray product offerings). Box Office – Most current domestic results available. 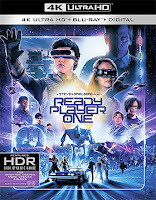 For the period ending May 18, 2018 ... New DVD and Blu-ray selections added to the DVD & Blu-ray Release Report's database. 05/15/18 — Released Tiffany Haddish: She Ready! From the Hood to Hollywood! Paramount Home Media announced this past week that director John Stevenson’s animated sequel to Gnomeo & Juliet, Sherlock Gnomes, will be available on June 12 as DVD and Blu-ray/DVD Combo Pack selections. The ARR works out to 81 days and domestic box office receipts currently stand at $41.8 million. 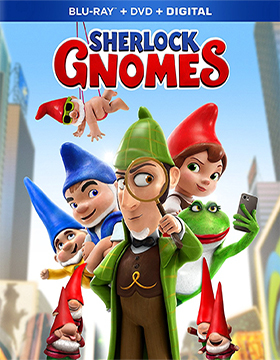 Gnomeo (voiced by James McAvoy) and Juliet (Emily Blunt) team up with the famous Sherlock Gnomes (Johnny Depp) and his sidekick, Gnome Watson (Chiwetel Ejiofor), to solve the mystery of the missing garden gnomes! Of course, the evil Moriarty (voiced by Jamie Demetriou) is behind the theft, but in an exciting open sequence this dastardly villain is seemingly crushed to smithereens by a dinosaur skeleton. But, we soon learn that Moriarty is the master of deception. Clues must be followed, misunderstandings must be resolved and the garden gnomes must be saved before Moriarty works his evil mischief and crushes them!!! Bonus goodies are limited to the Blu-ray/DVD Combo Pack SKU. There is a behind-the-scenes presentation titled “Gnome is Where the Heart Is,” plus three featurettes — “All Roads Lead to Gnome,” “Miss Gnomer” and “Animating Sherlock Gnomes” — the Mary J. Blige music video, “Stronger Than I Ever Was” and animation tutorial title “How to Draw” (Sherlock Gnomes, Watson, the Goons and Moriarty). 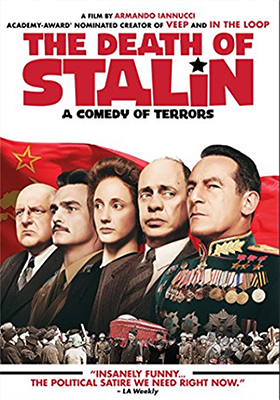 In other release news from Paramount Home Media this past week, look to June 19 for the DVD debut of director Armando Iannucci’s The Death of Stalin, a devastatingly funny black comedy about the death of Joseph Stalin in March of 1953. The ARR for IFC Films theatrical release 102 days and the box office take was $7.8 million. This is the “Cliff Notes” version of the events that occurred in the immediate aftermath of Stalin’s (played by Adrian McLoughlin) sudden death from a cerebral hemorrhage in early March of 1953. Since he was a dictator, there was no clear line of succession, which means a power vacuum was created … which is precisely what filmmaker Armando Iannucci focuses on (with satirical glee, we might add). Lavrentiy Beria (Simon Russell Beale), the head of the secret police, immediately begins to plot a rise to power — Beria was even a suspect in “poisoning” Stalin — and his puppet will be Malenkov (Jeffrey Tambor), but Khrushchev (Steve Buscemi) and Molotov (Michael Palin) have plans of their own. Throw in Stalin’s daughter, Svetlana (Andrea Riseborough) and his crazy son, Vasily (Rupert Friend), and you have plenty of comrades with a lust for power to go around. Thus begins a Machiavellian dance of power, which history records that Khrushchev won by year-end. 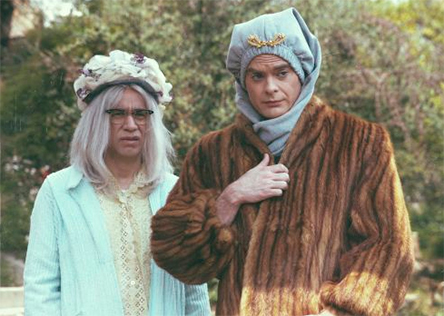 Even though it has been nominated for the Emmy Awards twice for Outstanding Variety Sketch Series, there’s a pretty good chance you might have missed a certain cable series from producers Fred Armisen, Bill Hader, Seth Meyers and Rhys Thomas. After all, there is just so much time in the day and those “500 channels” hum along 24/7 and upon seeing the title Documentary Now! in the cable listings it might not be an attention grabber for you. 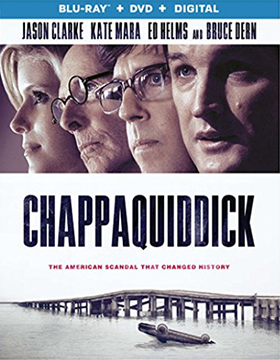 Documentaries can be a tad dry and usually targeted for a specific audience. Documentary Now! is not what you think. 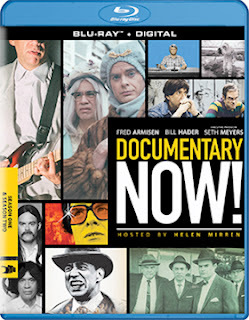 If you thought Spinal Tap, A Mighty Wind and Best in Show were hilarious as muckumentaries, then Documentary Now! is something that you are going to want to discover! And coincidently, Mill Creek Entertainment has just announced that double-disc DVD and Blu-ray helpings of Documentary Now! have been added to its Aug. 7 price-to-collect release calendar featuring the first two seasons. How convenient is that!! All 14 episodes from the series first two seasons are included here. Each “documentary” is hosted by Helen Mirren and features Fred Armisen and Bill Hader, plus guest stars, which include the likes of Anne Hathaway, Jack Black, Faye Dunaway, Mia Farrow, Peter Fonda and filmmakers Paul Thomas Anderson and Cameron Crowe … and more! You can now get the details — with tongue firmly planted in cheek — on all of the juicy stories that didn’t happen!! !